In 1915, the Paseo just north of Armour Boulevard was lined with mansions. Those lavish residences, once home to several families of German heritage, are no longer standing. The house on the northwest corner of Armour and Paseo belonged to Hans Dierks, owner of coal and lumber companies. 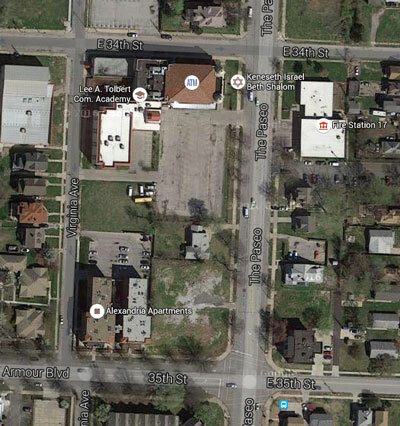 The block is now mostly vacant, as seen in this recent Google maps aerial photo. While many blocks of Midtown have barely changed since the early 1900s, this block of Armour at the Paseo looks like a different place today. The heyday of the block began just after the turn of the 20th century, when wealthy and successful captains of industry began building along the Paseo. 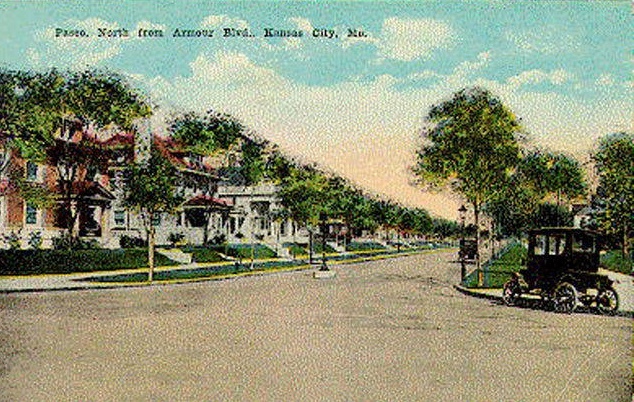 But the prestige of the corner of Armour and the Paseo had begun to fade by the 1930s, when Kansas City’s wealthiest families abandoned their Midtown mansions, often preferring the new luxury residential hotels being built along Armour Boulevard. As part of our Uncovering History Project, the Midtown KC Post is taking a look at each block in Midtown, including a set of 1940 tax assessment photos which is available for many blocks. Unfortunately, we don’t have access to the tax photos for this block (from 34th to Armour, from Virginia to the Paseo), but we are able to piece together some of the history of the block from other sources. 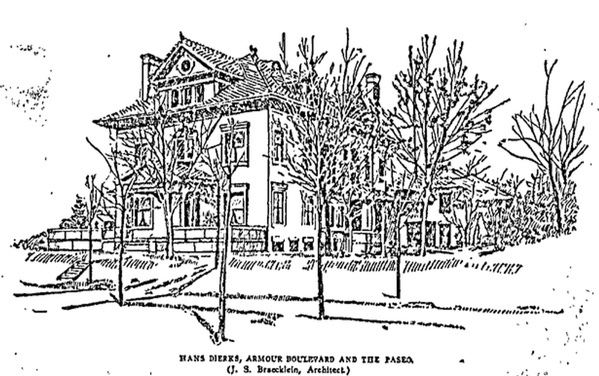 A 1905 sketch of the Dierks residence. In 1905, successful businessman Hans Dierks picked out a prime location for his new home: the northwest corner of Armour and Paseo Boulevards. Dierks was the head of the Dierks Lumber and Coal Company. He hired architect J.G. Braecklin to draw up plans for a three-story, 16 room home. “It will be built of Kansas City bird’s-eye pink brick and Carthage stone, with a tile roof. The interior will be finished in mahogany and quarter-sawed oak. The house will cost $25,000. One feature of the equipment of the house and stables will be telephones in each room. These telephones will be operated by means of a private switch board,” The Kansas City Star reported that year. The 1910 census shows Dierks living in the home with his wife Bertha, a nephew and two Swedish servants. His neighbors included wholesale cigar manufacturer Alexander Rothenberger at 1326 Armour. North of Dierks on Paseo, Jerome Bernheimer, an investment broker, moved in with his wife and son. The Dierks, the Rothenbergers and the Bernheimers were all the children of German parents. From the records, it appears that the families along the Paseo lived well. They all had servants, according to the 1920 census, including black, white, and Swedish chauffeurs, cooks and housekeepers. Jackson County Sheriff and later lumber salesman John Rood lived nearby at 3417 Virginia. Other Virginia residents in 1920 included the family of Major R.T. Ward of the U.S. Army Engineers Corps; Convention hall manager Lewis W. Shouse and his family; and a printer named John Smith. Dierks lived in the home until 1924, when he moved into the fashionable new Sophian Plaza Apartments. His home then stood empty for a decade before it was razed in 1933. The most striking landmark of the block is the former Beth Shalom Synagogue at 3400 the Paseo, built in 1927. 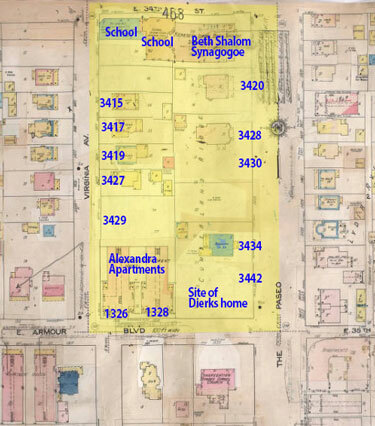 In 1955, a renamed Beth Shalom congregation bought land at Wornall and Bannister, following the move of population from Midtown further south. 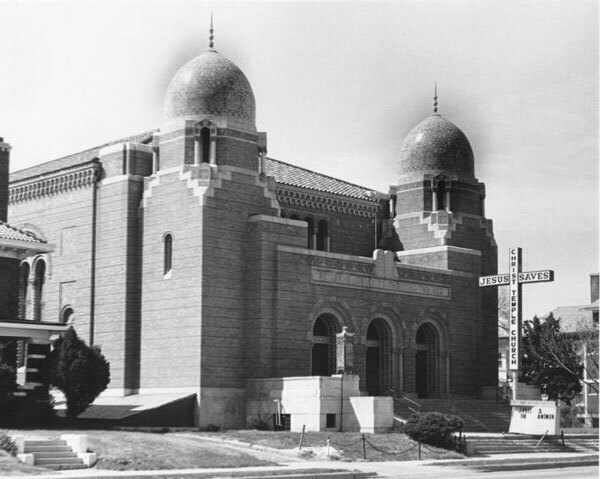 “The old synagogue was vacated in 1969 and the complex was sold to Christ Temple Pentecostal Church,” according to the library profile.